Mr. Craig Johnson, Dr. Bill Ernoehazy and myself have been looking at a common engraving pattern on sword blades that is often described as a series of lines and dots most often running along side a fuller. These often terminate together in a cross depicted at the end in the center of the blade. We have come to the conclusion that this particular pattern may well be representative of a rosary or prayer beads. I made this observation a few years ago when visiting the National Museum of the American Indian with Bill Grandy. You can read his report here. The timing was such, that my older son had just recently been confirmed in the Catholic Church and one of his confirmation gifts was a wallet rosary. (I've attached a picture of one below.) Looking at these two swords at the NMAI, the resemblance stuck out. Shortly afterwards I had the opportunity to discuss this observation with Mr. Johnson and Dr. Ernoehazy and they agreed that it was likely the case that this engraving pattern started as a depiction of a rosary. There is considerable variation in this pattern. The shape of the lines, the number of dots, even the type of cross is not consistent. 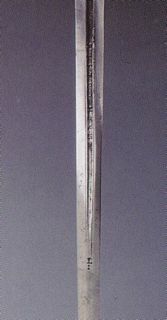 Some later period swords have even simplified the design down to simply lines with a cross. At that point, the pattern may have simply become traditional and had lost its original meaning as a specific religious tool. 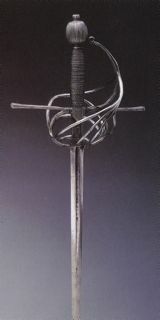 It is even used on modern reproduction weapons, often in its simplified form of lines and a cross, such as that on Albion's Gallowglass. Though we have been referring to these swords as rosarial swords as a means to identify them, the patterns do not necessarily depict a modern rosary recitation. They do, however, correspond with early prayer bead patterns and recitations. Prayer counters have been used historically by many world religions and even in the Christian religion their use predates the “Hail Mary” and the modern rosary prayer which includes specific meditations on the life of Christ. Some early prayer beads were used to count the number of repetitions of the “Our Father” and were called Paternoster beads. Taking this idea that this engraving pattern of lines and dots was meant to be representative of Christian prayer beads of some sort, Mr. Johnson, Dr. Ernoehazy and myself would like to collect images of these swords and compare them to each other and the evolution of the pattern over time as well as comparing it to the beginnings of the rosary. I have attached a few images below that I scanned from books in the Library of Congress. We would also be very interested in any mention of this pattern in period commentary or scholarly mention of this pattern representing prayer beads in scholarly works. We would welcome input from myArmoury readers that would include more of these rosarial swords. 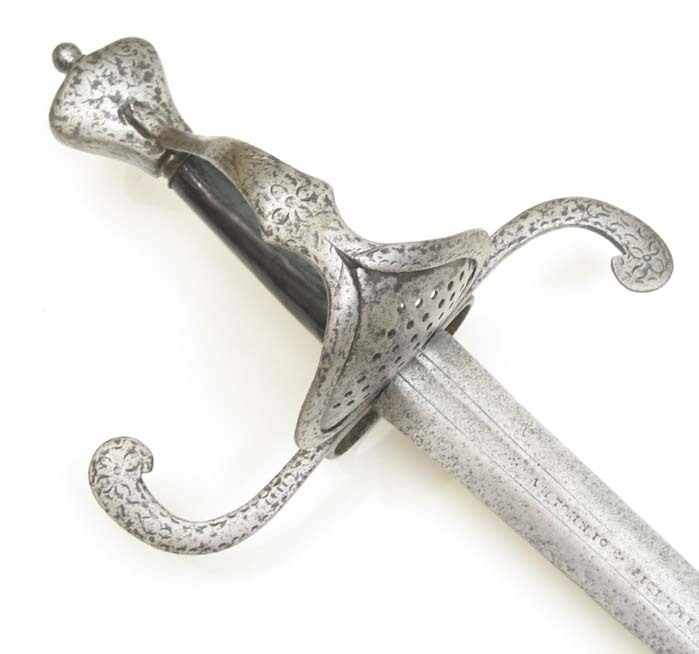 Close up of blade on the cup hilt rapier. As a fan of swords and of the rosary devotion I will be following your research. Very interesting indeed. When Pameal first pointed this observation out to me, my eyes widened and I figuratively smacked myself on the forehead because I'd seen this decoration thousands of times, but never once did it occur to me that it meant anything more than aesthetics. I'd approached some other sword scholars and asked them if they'd ever noticed this, and they all had the exact same reaction as I did. great work! We take crosses on pommels for granted, but the link between prayer beads and sword is certainly unexpected, but when confronted with the importance of religion , and religious conflicts, in the time frame that these weapons cover, I end up having the same reaction as Bill, it now seems obvious. Keen eyes and good work. As much as I hate posting "me too" messages, I have to say, when she mentioned it to me I reacted the same way. I think she's on to something. This is a great project. If you want to turn it into a myArmoury Feature article, let us know. I'd suggest you contact forum member Don Stanko. I've photographed his collection of antiques and at least 3 swords have this type of decoration. I don't feel comfortable posting the pics without his consent, though. Also, he knows more about the dating of his swords than I do. I think we've conversed about this as well in the past. I have collected photos of examples of this feature. When I find the time, I can gather them up and post them. It's been a fascinating subject to me for the last several years. I don't own any of the usage rights to the images and many that I have do not have source info available, but can post them on the forums under "fair use". Beyond that, it's going to be tough. 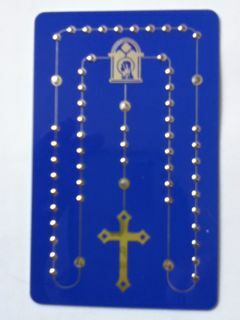 Collecting examples of these "rosary-inspired" designs found in blades was a project I had taken up a few years back. Unfortunately, due to the time constraints of work and other things, it's been abandoned. I'm glad to see some interest in the subject. Here are an even dozen examples I had already collected and formatted. It's a start, at least. Oh, wow, Nathan! Thank you! Those are fantastic. Chad, thank you for the advice. It is much appreciated. I would like to see this project become something of value to the community. The biggest problem I have with this theory - beyond the circumstantial illustrations - is that (historically) the devotion that is subscribed to the Rosary today and the Rosary in its present form is essentially a product of Spanish and French influenced 19th Century Catholicism. Certainly the Rosary existed before then having its origin in the "chotki" of the Eastern Church but the devotional aspect was not present in the 13th - 14th century nearly as much as today. Just a thought. This is a very good point. I can't recall seeing these symbols on sword blades pre-1450 and that's a generous statement in that I am struggling to remember anything pre-1520s. It's a very common thing to find on 16th century blades. I most certainly agree that these do not correspond to modern rosary devotions. As I said above, though, prayer beads were in Christian use well before the modern rosary. There certainly is no consistency to the number of lines and dots in these engraving patterns and thus certainly do not correspond to modern devotional decade recitations. We are using the term "rosarial swords" to illustrate to a modern audience what these symbols may mean. We could have also called them "Paternoster swords." Oh, and it is also why we are hoping some myArmoury members might have come across period commentary or scholarly mention of this pattern. Until then, yes, the evidence is only circumstantial. Don's given me his okay to post these, so here they are. Included first is a hilt shot, then a closeup of the blade marking for each. Don can fill in the details on dating/origin/etc. Chad your photos turned out great! 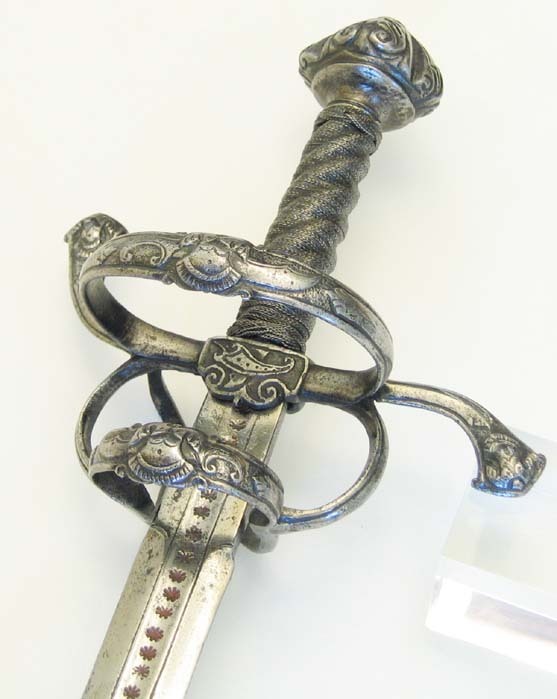 The first sword is published in Leslie Southwicks Priceguide to Antique Edged Weapons, page 90. 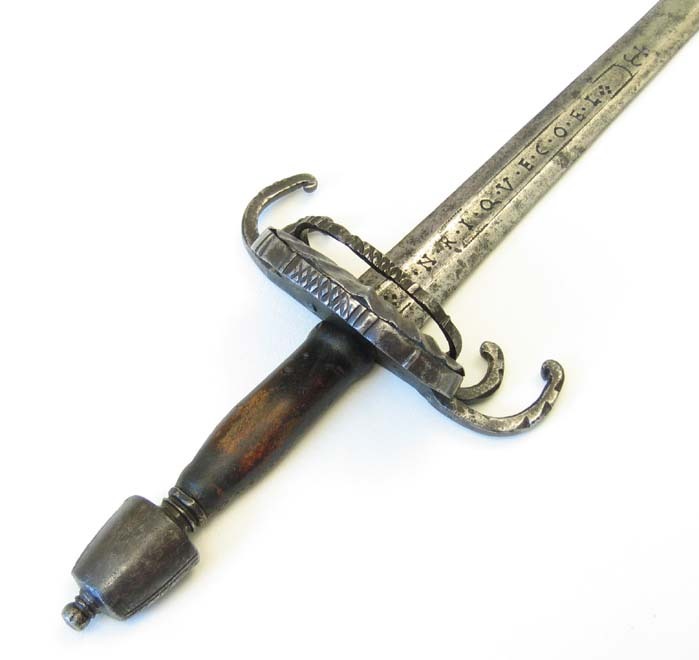 Its listed as circa 1650, Northern European Broadsword. 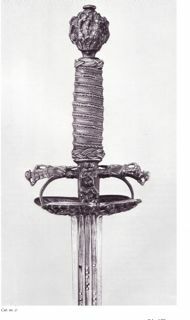 The second is a Crabclaw Hilted Italian Broadsword, the blade Made by Enrique Coel or otherwise known as Heinrich Koll. He was active from 1588 till 1610 ( a German Swordsmith who worked chiefly in Spain). 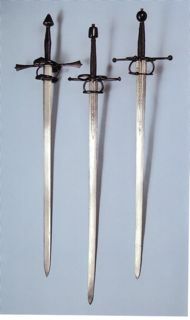 The third one is a Semi Swept-hilted sword, circa 1580. I'm not sure who made the blade, its marked with saltires down the fuller, no name and a common makers mark. All of the weapons, to the best of my knowledge are complete, not composites. Is there any data suggesting these are a German (or otherwise) phenomenon, and what stretch of time is covered? Like Nathan, I don't recall much in the way of pre-16th c., but how late do they go? 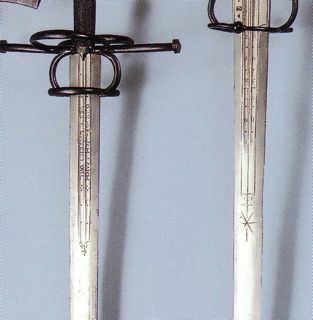 Many of the longswords including several in my post above are Bavarian / South German in origin. Chad and Don, thank you so much for your contribution! Christian, I don't know the answer to your questions, which is one of the reasons I have been asking for help on this project. My contribution thus far has been to say, "Hey, that looks like a rosary!" and spending some wonderful hours in the Library of Congress looking through picture books and collecting images.